With the numbers of feral goats approaching 3 million, eradication is all but impossible. Within a given area Australian Feral Management can and does control populations of feral goats with great success. Goats (Capra hircus) arrived in Australia with the First Fleet in 1788. As they were small and hardy, ate a range of plants and provided milk and meat, they were convenient livestock for early European settlers. During the 19th century, sailors released goats onto islands and some areas of the mainland for emergency food. Certain breeds were imported for their hair. More recently, goats have been used to keep plantation forests and inland pastoral land free of weeds. Feral herds developed as these domestic goats escaped, were abandoned or were deliberately released. 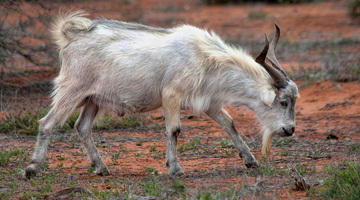 Feral goats now occur in all Australian states and on many offshore islands, but are most common in the rocky or hilly semiarid areas of western New South Wales, South Australia, Western Australia and Queensland. In 1996, there were about 2.6 million feral goats in Australia. Or send us an email using the contact form on the right.